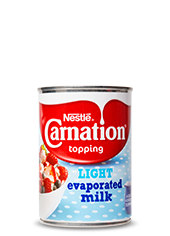 Carnation Evaporated Milk Light is a deliciously creamy yet light topping (less than 5% fat!) for all your favourite desserts from a fresh fruit salad to a sticky toffee pudding. 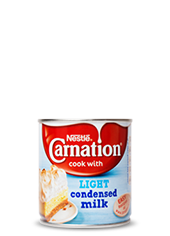 Made from fresh skimmed milk, so it’s a source of calcium and has added vitamin D, Carnation Evaporated Milk Light is available in a 410g tin. Contains 79% less fat than single cream. 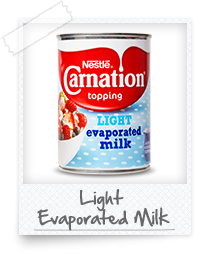 Evaporated Milk Light is rated 4.9 out of 5 by 9. 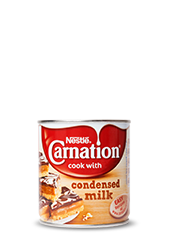 Rated 5 out of 5 by Carlene from Great cupboard staple I always keep at least three of these tins of milk on hand for last minute uses. Savoury sauces, pasta, soup, ice cream, so many uses. Cakes and icings too. Even in coffee it just lifts that caffeine hit to another level. You feel slightly less guilty using the lite version. Thanks Highlander ! Rated 5 out of 5 by FG10 from As good as the full fat version! I tried this in place of my usual supermarket own brand and was really glad I did! 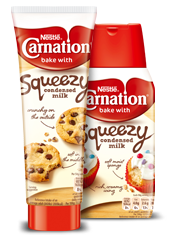 This was creamy, delicious and tasted so much better than the full fat version of my supermarket brand. I’m a carnation convert! 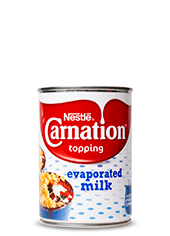 Rated 5 out of 5 by Evie183 from Carnation Rice Pudding I loved the rice pudding my grandma used to make when I was a little girl. 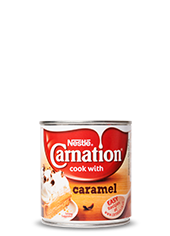 By using Carnation lite evaporated milk in the recipe I am taken back in time enjoying a delicious dessert like grandma used to make. Rated 5 out of 5 by LMT2019 from Fabulous chilled on breakfast I use the light carnation cereal such as muesli or wheats as a nutritious and satisfying start to the day that sees me through the morning. Delicious and part of a balanced diet.